I have had the idea of the performance in my head for years and PortFringe seems like a perfect experience to get the idea out of my head and onto the stage. My job over the last 11 years has dealt with Corporations and what I have learned is that we dealing with heartless people. My show is to expose the sad world of business in a friendly way in hopes we can make the world more enjoyable for more people. My show would be relevant at any time since the first investor stepped up, but is perhaps most relevant right now due the global economy and the unprecedented modes of communication and its reach. Everybody is tied to the global economy now so we need to know our part and make it how we want it. I have had the same job for over 11 years and my mother still has no idea what I do. She doesn’t get the show. I hope she will be able to attend and see what has been in my brain for years. Even if she doesn’t understand it she will love it. I would tell my crush that it is groundbreaking and must see entertainment. I’ll be able to answer any questions she has after the show over a bowl of home-made ice cream and brownie. Yum! I haven’t had a chance to look yet, but I’ll definitely check out the Finyette Productions feature. They are the ones who inspired me to sign up for PortFringe. I have enjoyed Mark and Ashley’s shows over the past few years and know I will be awed and entertained. I just scanned the listings and Body | Mass looks good. Sounds like something different and a bit naughty. I hope I can handle it. 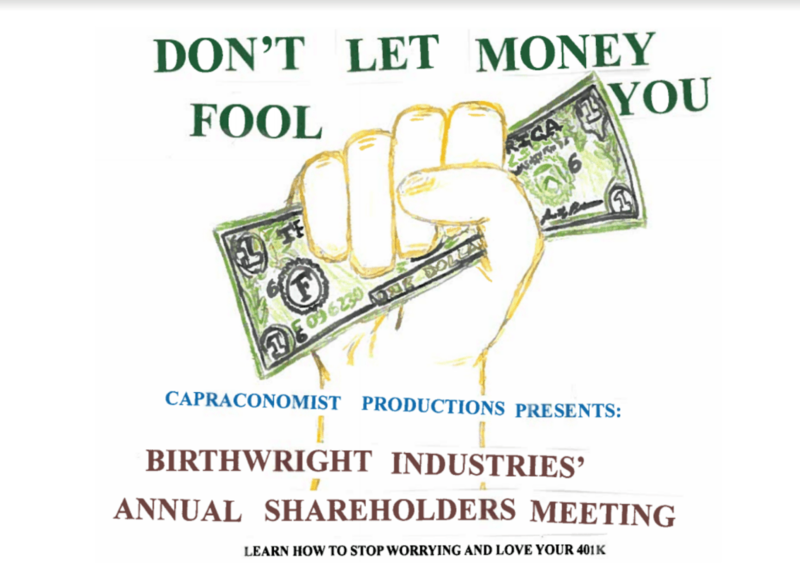 SEE BIRTHWRIGHT INDUSTRIES’ ANNUAL SHAREHOLDERS MEETING AT PORTFRINGE 2018!